Government Printing Office, Washington, 1987. Printed for A. Millar . . . in the Strand, London, 1749. Printed by E. Cotes, in the Year 1652, London, 1652. Ricardo Veloso, Editor, Libreria Cervantes, Havana, 1922. Printed for J. Dodsley, in Pall-Mall, London, 1785. James Ridgway and Son, Piccadilly, London, 1836. Imprinted at London by Robert Barker [etc. ], London, 1630. National Center for State Courts, Williamsburg, 1979. Printed by William du-Gard, and Henry Hills [etc. ], London, 1654. Printed for J. Roberts at the Oxford Arms in Warwick-lane, London, 1727. McGraw-Hill Book Company, Inc., New York, 1930. James Ridgway, Piccadilly, London, 1850. Australian Law Reform Commission, Sydney, 1980. Printed: And Sold by J. Roberts in Warwick-Lane, London, 1725. Public Affairs, New York, 2013. Dean & Son 160A, Fleet Street, London, 1887. A rare work written by a Middle Temple barrister devoted to the 1887 Act, fundamentally altering previous efforts (which had been charitable only), now mandating "the compulsory acquisition of land for . . . allotment amongst the labouring classes"
Henry Sweet, 3, Chancery Lane, London, 1857. John W. Parker and Son, West Strand, London, 1857. The grand jury charges which Hill delivered while Recorder of Birmingham, with much related materials, the post he held for a quarter century and "more than anything else, established [his] reputation as a 'criminologist' and penal reformer"
Research Institute of America, Inc., New York, 1986. Sold by Adam & Charles Black. Printed by Forrester & Ruthven, Edinburgh, 1840. Printed for Elizabeth Lynch . . . in the Four Courts, Dublin, 1783. 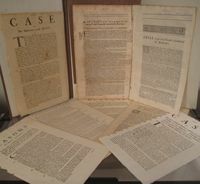 A collection of rare ephemera and similar documents all pertaining to bankruptcy and its reform, offering the varied perspectives ultimately leading to the legislation (of 1732) whose provisions "were the foundation of the modern law of bankruptcy"
E. P. Dutton & Company, New York, 1970. Anno Regni Gulielmi III Regis Angliae, Scotiae, Franciae & Hiverniae, Septimo [and Octavo]. At the Parliament begun at Westminster the Two and twentieth Day of November, Anno Dom. 1695. In the Seventh Year of the Reign [etc.]. Not in Wing. Folio. Printed by Charles Bill, and the Executrix of Thomas Newcomb [&c], London, 1696. Colegio de Abogados de Lima, Lima, 1970. Printed for J. Roberts, near the Oxford Arms in Warwick-Lane, London, 1721. Printed for A. Millar, in the Strand, London, 1753. Oxford University Press, Delhi, 1977. Printed by Henry Hills for Humphrey Tuckey [etc. ], London, 1655. Printed for, and are to be Sold by Randal Taylor, in Amen-Corner, London, 1685. Printed by William Eyres; and Sold by T. Cadell [& three others], London, 1789. By the Committee, Madison, 1973. Printed by E. Cotes, London, 1652. Printed by J. Cottrel, for Hen: Fletcher [etc. ], London, 1657. 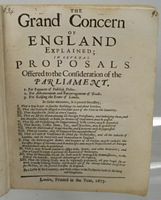 Sheppard's greatest work, called "the most comprehensive design for the reform of English law and society published in the seventeenth century" and, by John Baker, "a coherent programme of reform [which] seems remarkably prophetic"
T. Powell [and] T. Marsh, London, 1562-1575?. Your search request for "legal reform" has matched more than 50 records. (80 books matched.) If you would like to see more than 50 records, you can adjust this parameter and resubmit your search.